Ever seen an alien with a flying umbrella? Yes you have. Her name is Mary Poppins! 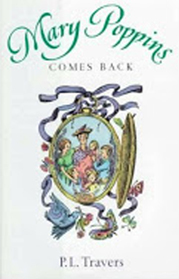 The classic Mary Poppins was the very first book I ever read, when I was around six years old. A magical world created by Australian-born Pamela L. Travers, based on a cosmic philosophy, it put me on the path I am now on as a UFO-paranormal investigator and writer. 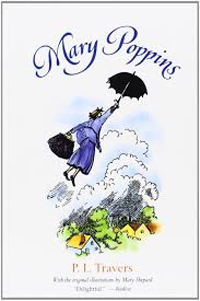 Years later, Travers told me during a phone conversation that Mary Poppins is not a simple children’s book. It is much more. Reincarnation, travel to and from other planets, paranormal experiences, levitation, magic and most importantly, alien abductions are some of the main topics of this book. In fact, the Mary Poppins stories are easy to interpret as thinly-veiled tales of alien contact, written by a dedicated believer in the reality of other dimensions. I have to make it clear that the book Mary Poppins and the 1964 Disney movie have almost nothing to do with each other. The original Mary Poppins is a mysterious nanny who comes from the sky, flying by using her umbrella. She comes when the wind changes and stays until the wind changes again. Although the first book was written in 1935, the story is timeless. The main characters are the Banks family children: Jane, Michael, twins John and Barbara, and little baby Annabel whom Mary Poppins takes care as a nanny. From the first moment, it is very obvious that Mary has extraordinary gifts and paranormal abilities such as flying, communicating with animals, time travel, telepathy and more. She is able to materialize objects such as a portable bed, a comforter, pillows, boots and nightgowns from an empty handbag. She can control time, making it faster or slower. She can enter into pictures and pass to other dimensions together with the children. In the book she is quite a mystery woman. The author never reveals her real identity, but she gives us plenty of clues to guess about her origin. Also, in the book, nobody knows if Mary Poppins has a family or not. Her birthplace and her age remain unknown. It seems that she is a dedicated nanny, very different from the others of her day. She travels a lot. Each story is a new adventure where the kids and Mary take extraordinary trips to distant places, such as under the sea or to another planet. She also introduces us to her friends, who are very unusual personalities such as mythological characters, living Tarot cards, persons or cats who live on a distant planet. In fact, the solar system, stars and planets have a very important role in Poppins’ world. One of the stories is a perfect – and perfectly disguised – retelling of a typical alien abduction. Jane and Michael are visited by a star from the night sky which comes into the children’s room from the window. After a short talk the little star invites the kids to a circus in the sky. Jane and Michael follow the visitor and all together they climb to the night sky. 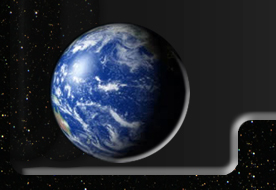 When they turn and look back, they see that the Earth is the size of a marble from the high distance. They keep climbing until they arrive at a huge circus tent. Inside the circus, all the artists are very well known stars such as Orion, Leo, Castor and Pollux, Saturn and Capricorn. The sun, who is described as Apollo, comes to the circus and is highly respected by the others. The night’s special guest is Mary Poppins, whom everybody calls the Morning Star or Venus. Cosmic symbolism is given under the blanket of a fairy tale here. Mary Poppins is Venus. In other words, she is the Goddess who is also known in other cultures as Isis, Ishtar, Diana, Artemis and Virgin Mary. She is a celestial mother and protector. In this life or incarnation she uses the identity of a British nanny but she is still the cosmic goddess. She is from out of this world and carries the cosmic truth to the chosen ones. Literally, she is a cosmic teacher. The book offers us plenty of adventures related to nighttime visitors from the sky. In another adventure, Jane and Michael are visited by an invisible night visitor. They cannot see him, but they hear his guiding voice. The mysterious visitor takes them to a special ceremony where all the animals of the city zoo are out of their cages. Bears, lions, penguins, wolves, elephants and birds enjoy the special night talking with the kids. Later, they come to the house of the snakes where the real king of the animal world is a very old and wise snake. There they find Mary Poppins as the honorary guest of the Snake King celebrating her birthday. The other interesting point is that Mary Poppins and the Snake King come from the same family. Venus (Mary Poppins ) and Snake King (Feathered Serpent of Central American cosmology) meet once again. According to Central American legends, the Feathered Serpent God Quetzalcoatl came from Venus and lived on Earth as a human being. As we know, Venus is still considered to be related to a Reptilian or Snakelike ET race, which is very popular in modern Ufology. When the first edition of Mary Poppins was published in 1935, there was no such thing as Ufology. 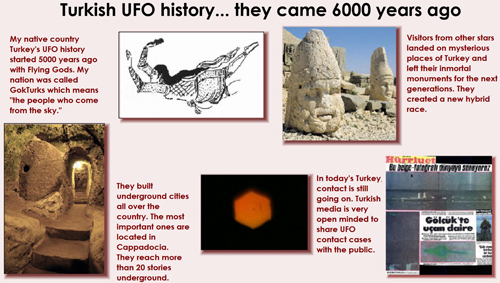 Although numerous UFO sightings were reported, especially in Europe, nobody knew about their origin. Close encounters with extraterrestrial beings and alien abduction concepts weren’t specified yet. But Pamela L. Travers was emphasizing the existence of the visitors from other planets as if she was predicting modern day alien abductions. 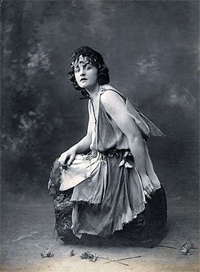 Although she became a world-famous author with her Mary Poppins creation, before and after this masterpiece, Travers wrote numerous poems, stories and other novels as well. She was an avid researcher of mythology, mysticism, philosophy and religions. And she was a friend and disciple of the famous philosopher George I. Gurdijeff. It is known that they met in Paris in the 1930’s. Travers was very much influenced by Gurdijeff’s studies; she quickly became an expert in Islamic studies, especially in Sufism. As a philosophy and mystic teaching, Sufism is based on humanity’s relationship with the cosmos and the inner search for being one with the creator, God. According to Sufism, the universe itself is a living being and encompasses the planets and their inhabitants. Sufism was also Gurdijeff’s path and it took him to my native country, Turkey, in the search of an ancient brotherhood founded by an Extraterrestrial race thousands years ago around Mt. Nemrud which is located in eastern part of Turkey. It may seem to be a very long way from Sufism to a magical nanny who creates miracles in 1930’s London. But the essence of the philosophy takes us to the same path: we are not alone in the universe and we have been visited by the Extraterrestrials since ancient times. They generally don’t reveal their real identity and we know them as fairies, jinns, spirits and maybe guardian angels. For some reason they come with their own cover-up in order not to reveal their otherworldly origins. Mary Poppins stories were not limited to only visitors from other stars. For example, newborn baby Annabel remembers her past life clearly. She doesn’t want to accept that in a short time she’ll forget the past life memories. This is a very well known aspect of reincarnation. Babies and young children are able to remember their past lives, but after a while they quickly forget the past life memories. When the time comes to say farewell, the magical nanny leaves in a very unique way. In one of the stories she rides on a beautiful carousel which slowly takes off and keeps flying until it is seen as a bright, circular, Unidentified Object in the night sky. As I mentioned before Mary Poppins, or maybe Pamela L. Travers, put me on the path of the search for the unknown. Years passed and my first UFO book was published by the same publisher who published the edition of Mary Poppins that I read when I was six. Nice coincidence, isn’t it? One day I had the urge and need to contact Travers and talk to her to thank her for giving me this passion of my life. In 1991 I found her address and sent a letter. It was the biggest surprise when I received her answer in her own handwriting. Pamela L. Travers was 92 years old, living in London and her health wasn’t good at all. Later we had the nicest phone conversation. I thanked her with all my heart for giving me the enlightenment since my very young age. The dream world where she put me became my reality up to today. She was happy to know that her message had found the right target. 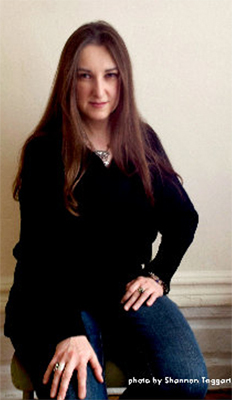 Farah Yurdözü is a Turkish UFO, paranormal, esoteric researcher, writer, and author of several best-selling books in her native land. Fluent in Turkish, English and Spanish, she’s known on several continents as an authority on UFOs, paranormal phenomena and the metaphysical. Farah’s gifts as a psychic medium were featured in a TLC paranormal investigation TV series titled Dead Tenants. She is a producer at Jerry Pippin Internet Radio and is a former columnist for (the now defunct) UFO Magazine. Though her work reflects a passion for all aspects of the paranormal, her main area of study is abductions and close encounters. Farah continues her work as a UFO researcher, writer and lecturer, and appears in major UFO conferences all over the United States from Roswell to California, Nevada to New York City. The Fourth Kind was alleged by some to be a mockumentary, a movie depicting fictional events, but presented as a documentary. However, in this case, the “fictional” events portrayed in The Fourth Kind represent real or nonfictional events that have been reported during ET alien abductions for several decades. The Fourth Kind was presented by the movie studio as being based on real events occurring in Nome, Alaska in 2000, in which psychologist Dr. Abigail Emily “Abbey” Tyler uses hypnosis to uncover memories from her patients of alien abduction, and finds evidence suggesting that she may have been abducted as well. The film was largely disparaged by critics, but made $47.71 million (U.S.$) in cinemas worldwide despite efforts to discredit the film. It was not a “horror film,” as people claimed. All in all, it was actually a good movie. However, it did not portray the “alien abduction” phenomenon as certain researchers felt that it should. They were not portrayed positively or even neutrally, and at the same time, the movie focused heavily on the use of hypnosis in retrieving memories of alien abductions; much more so than is used in what many consider legitimate investigations. As is usual, it was the subject matter of ET contact and alien abductions that took another hit, which is how disinformation and misinformation campaigns work. After the movie The Fourth Kind premiered, I tried to contact Olatunde Osunsanmi to interview him for UFO Magazine. When I Googled his name, only a few pages came up, and there was very little information about him. No email address, no website, no phone numbers. There were no personal pictures of Mr. Osunsanmi except the official poster of his movie The Fourth Kind. He is the director and the writer of The Fourth Kind in which he brings a completely different interpretation to the alien abduction and close encounter phenomena. The Fourth Kind was in theathers in November, 2009. The movie was successful in ticket sales, but I don’t think that it became a sensational hit for many reasons that I’ll discuss below. It was considered a horror movie and I totally disagree with that assessment. But it is clear that Olatunde knew very well what he was doing, as opposed to the general tendency in Hollywood, in which movies about UFOs and aliens take the subject too superficially or too violently. The Fourth Kind takes us to the very deep and unknown fields of the alien abduction phenomenon. And yes, some of the aspects could be really disturbing and scary for some eyes. But with increasing information about the alien abductions and testimonies, we already know that being abducted or contacted by “them” doesn’t offer a rose garden most of the times. According to press releases, the writer was inspired by the unexplained dissapearances and deaths in Nome, Alaska to create this story. Although the alien abduction phenomenon is being discussed all over the Internet, some locations like Nome are not very well known in the abduction literature. Maybe that’s why these locations are preferred by the abductors as being located far from everything. Olatunde used the known symbolic elements of the alien abduction such as owls in his movie. Many abductees claim that they see or are visited by an owl at the beginning of the contact. The symbol of the owl is mostly used as a screen memory or cover by the visitors. That’s not new for a regular UFO / ET followers. But, later the filmmaker takes us to a totally new field where visitors directly contact the humans using abductees’ vocal cords, voices and physical bodies. The scene where the abductee “Scott” is under hypnosis turns out to be a demonic exorcism session. In general, alien abduction and demonic possession have so many common aspects, and Olatunde brings out this aspect in a striking movie scene. Olatunde’s aliens are not little, tiny, quiet, mechanical Greys. He talks about 6 1/2 foot tall, skinny beings. They have beige colored skin, gigantic heads and huge black eyes. And Olatunde makes them speak in an ancient language which happens to be Sumerian. He links the ancient Sumerian gods to the present day alien visitors. He includes Owolowa Odusami, a Nigerian scholar as an expert in Sumerian language and ancient gods theory. We are very familiar with the Sumerian Gods theory and the Extra Terrestrial race of the Anunnaki. Historical, mythological and linguistical research show that what Sumerians used to call Gods and Goddesses were a group of scientists who came to our planet with a very clear agenda: to create a hybrid race. When these beings speak using abductee “Scott’s” voice with a highly distorted tone, they make sure that they are conscious beings who know a lot about Dr. Abigail Tyler and the others who are involved in the case. What we see in the scene is very similar to what real abductees describe during their experiences; a very intense and strong energy which controls the abductee’s body, causing temporary paralysis and the sensation of being lifted from the bed. When “Scott” is lifted from his bed, Dr.Tyler and other witnesses start to pray. The alien visitor says: “There is no need to pray,” as if trying to make clear that whatever your religion is, whatever your holy book teaches you, the alien power is beyond anything and cannot be stopped by praying. “Our creation. Examine. Ruin, destroy”. Channeling Extraterrestrial beings has been a way to approach the unknown since 1920’s. Many psychics and mediums from the spiritual research field claim that they channel ETs and receive information from them. 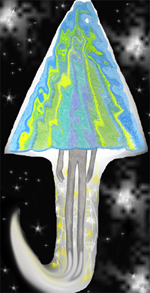 During a channeling, the visiting ET or entity totally controls the psychic’s physical body and mind. It speaks from his or her mouth, but uses a different voice and most of the time, speaks in a very deep tone. When the famous occultist Aleister Crowley contacted his spiritual guide Aiwass, Aiwass mentioned the Sirius star system as the entity’s origin. Another Extraterrestrial? Even today [the lines seemed blurred] between alien abductions, demonic possession and ghost hauntings as all three have many similar characteristics. These activities generally start around 3:00 in the morning. The experiencer cannot control his or her physical body during the experience. The room temperature changes and generally drops. Both after an alien abduction and a demonic attack or possession, the experiencer finds unexplained physical marks on the skin and starts to suffer from depression and insomnia; and as we see in some cases, they also suffer from serious health problems. This is why the scene with abductee “Scott” in the movie is considered as a possible demonic attack causing the movie to be labeled by some as a “horror movie”. There is another real fact about the movie: the writer and director Olatunde Osunsanmi obviously did intense research to write the story and it seems that he knows more than he shows. He is very close to the truth. Although the truth may be darker than we expect. He didn’t make a regular UFO Alien movie with non-stop special effects, explosions in every scene, running and chasing, culminating in a happy ending when the good heroes get rid of the bad aliens. If the aliens in our abduction stories are “bad,” we don’t really know it, but in the real life of an abductee there are no happy endings. The truth of the abductions is completely different than a regular moviegoer expects from a popular ET UFO movie. No explosions. No car chases. No violence. No big sensational hit. But believe me The Fourth Kind hit me very deeply, as I saw a completely objective reflection of the life of an abductee. The Fourth Kind is a reference to scientist J. Allen Hynek’s famous categories involving sightings of UFOs during which ET Contact is made. The screenplay for this film was featured in the 2008 Blacklist; a list of the “most liked” unmade scripts of the year. The end credits do not include the usual, “The events and persons depicted in this film are fictitious...” or “The film is based on the real events...” section. The habitual soundtrack used for the ending credits of the movie is changed by diverse audio tracks where people call a UFO reporting center explaining their sightings. The movie’s hoaxed interviews angered the families of real missing persons in and around Nome, Alaska, for trivializing their loss. Melanie Edwards, Vice President of Kawerak Inc. (an organization representing tribal peoples in Alaska), described the movie as “insensitive to family members of people who have gone missing in Nome over the years.” Universal has refused to discuss the movie with that organization or with local journalists. Film “Fakery”? – No. Although the people in the movie were not “real,” many of the events in the movie have been reported over and over again by alien abductees for the past 7 decades. Guerilla Marketing or “Fake News”? In addition to working on her new books, Farah is one of the country’s most sought-after spiritual advisers. A diverse clientele seeks her guidance on important life issues such as Love, Marriage, Career, Health and Home. With her unique intuitive insight and deep knowledge of the complex inter-relationships of the world’s great religions and traditions, Farah has the gift of making believers out of skeptics.